Tools of Change (ToC) Conference 2012 attendees are welcomed at a reception at the New York Public Library. In its sixth year, the Tools of Change Conference — just closed in New York City — easily held its own as one of publishing’s two great confabs of a stressful year, the other being last month’s Digital Book World Conference + Expo. January’s DBW (#dbw12) used “following data” to tell us where things lie (not lay, damn it) amid the sinkholes of today’s treacherous, fast-digitizing landscape. 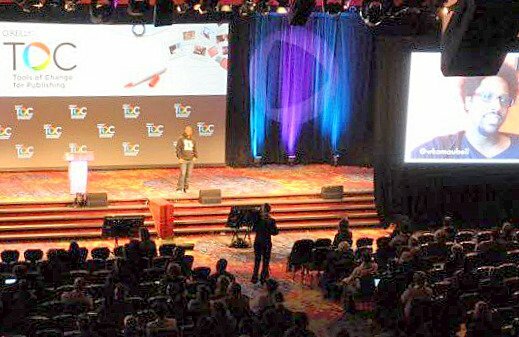 February’s ToC (#TOCcon) vowed to wield “Big Data” as a photon torpedo, LeVar Burton, in the battle for publishing’s cultural viability. Burton gave a Treky’s keynote on Tuesday in which he revealed that spotting Nichelle Nichols on the original bridge of Gene Roddenberry’s USS Enterprise helped him find his race and place in an entertainment industry that would later cast him in Alex Haley’s pivotal “Roots” and now platforms his RRKidz mission to get digital reading to kidz (not kids, damn it). Speaking of race, another adherent of Lt. Uhura’s persuasion, author and Onionist Baratunde Thurston, gave another keynote that day, plugging his book. Here is his keynote on video. Here he is with Terry Gross on NPR’s Fresh Air, in Baratunde Thurston Explains “How To Be Black” And here is his book in an enhanced edition, “enhanced” being a term we include less and less frequently in our publishing patois. More locution: ToC and DBW are perfectly aligned, like squirming twin Cupids, in their use of the term “keynote.” It once referred to an often long, always singular, rabble-rallying speech by a major figure of real heft. You remember Margaret Atwood at last year’s ToC? Well, of course you do. And you can refresh your memory when she does it again at AWP in early March. Today? Every girl can give a keynote. In fact, every girl and every boy targeted by arrows this Valentine’s Day seemed determined to do just that. A “keynote” now lasts 15 minutes, max. And it arrives in a candy box full of matching presentations, each of them crinkly-wrapped in the visuals that we Contemporary People must behold in order to focus, damn it, focus. The givers of today’s “keynotes” are frequently low-energy folks whose first calling in life clearly is not oration. They want to tell us that their software is better than your software. Did I mention locution? It’s all in how we say it, you see. “Scaling” could mean something less friendly to some soon. A Wednesday session, Scaling Content Development Through Automation, gave us Kristian Hammond of Narrative Science and Robbie Allen of Automated Insights in their talks on those computer-generated sports and real-estate reports you may have heard about, ex machina. For the record: This report is written not by a machine but by a human being made productive by caffeine rather than electrical current. Parse me, bubba, I’ve got yer data right here. But ’tis bootless to exclaim. Click to read this week’s full Writ­ing on the Ether col­umn at JaneFriedman.com.